Rated PG-13 for thematic material including disturbing situations involving the Holocaust. 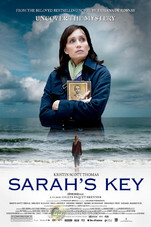 Based on Tatiana de Rosnay's New York Times best seller, SARAH'S KEY is the story of an American journalist living in Paris, Julia Jarmond (Kristin Scott Thomas), whose research for an article about the Vel' d'Hiv Roundup in 1942 in France ends up turning her own world upside down. In July 1942, Sarah, a ten-year old girl, is taken with her parents by the French police as they go door-to-door in the middle of the night arresting Jewish families. Desperate to protect her younger brother, Sarah locks him in a bedroom cupboard - their secret hiding place - and promises to come back for him as soon as they are released. Nearly seventy years later, Julia stumbles on the terrible secret that the home Sarah's family was forced to leave is about to become her own. As Julia's life becomes entwined with Sarah's heart-breaking story she must tackle the complex issue of how to live with the past and keep moving forward.